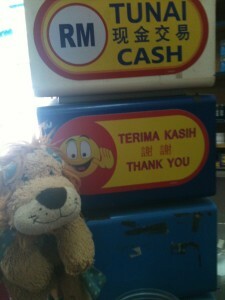 As Lewis the Lion ventured into Malaysia, he realised that his magic words really did have a positive impact on the people he met as they genuinely warmed to him when they could see him trying to speak their language. He learnt that by learning some Malay or Malaysian, it also helped him when he went to Indonesia as Malaysian comes from the Indonesian language family. (He learnt that the main difference is in the vocabulary as the grammar is quite similar: Malay was more influenced by Arabic and English and Indonesian was more influenced by Dutch and Javanese). Malay is the official language of Malaysia and Brunei whereas Indonesian is more widespread with 230 million speakers (from Indonesia and parts of East Timor). How are you?– Apa khabar (lit. What’s news?) or Ada baik – Apa kabar? Where? – Di mana? – Di mana? Where is the toilet? – Tandas di mana? – Di mana toiletnya?/ Di mana tempat kamar kecil?